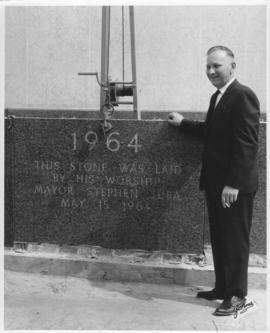 Shown in photograph: Mayor Stephen Juba and dedication stone for City Hall (Civic Complex). Stamp (on verso): John's Photo Studio, 555 Main St., Winnipeg, Man., Ph. WH 3-0259. Shown in photograph: Mayor Stephen Juba, councillors and other individuals (unidentified). Stamp (on verso): John's Photo Studio, 555 Main St., Winnipeg, Man., Ph. WH-3-0259. Shown in photograph: Mayor Stephen Juba, councillors and other individuals (unidentified). Stamp (on verso): John's Photo Studio, 555 Main St., Winnipeg, Man., Ph. WH 3-0259. Shown in photograph: Mayor Stephen Juba and other individuals (unidentified). Stamp (on verso): John's Photo Studio, 555 Main St., Winnipeg, Man. Ph. WH 3-0259. Shown in photograph: Crowd gathered for laying of the cornerstone at City Hall (Civic Complex), Mayor Stephen Juba at center. Stamp (on verso): John's Photo Studio, 555 Main St., Winnipeg, Man., Ph. WH 3-0259. Shown in photograph: Mayor Stephen Juba at center, councillors and likely other municipal officials and crowd of spectators. Stamp (on verso): John's Photo Studio, 555 Main St., Winnipeg, Man., Ph. WH 3-0259. Shown in photograph: Crowd gathered for laying of the cornerstone at site of City Hall (Civic Complex). Stamp (on verso): John's Photo Studio, 555 Main St., Winnipeg, Man., Ph. WH 3-0259. Photograph showing official party proceeding to the Council Chamber to be seated during the official opening of the new City Hall, October 5, 1964. Photograph showing Mayor Stephen Juba making an opening address at the Special Council Meeting in the Council Chamber at the official opening of the new City Hall, OCtober 5, 1964.